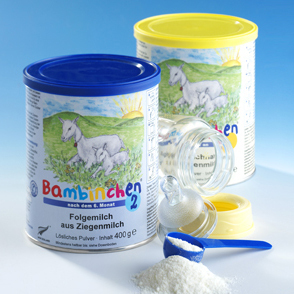 Bambinchen is a milk product made from goat’s milk. It is a fully-fledged food tailored to infants’ needs. Bambinchen 1 may be consumed right from birth. Bambinchen 2 can, but does not have to, be consumed from the 6th month onwards. Many satisfied parents continue to use Bambinchen 1 well after their child has turned six months – and have had great experiences! Like the Golden Goat full-cream goat’s milk, Bambinchen comes directly from New Zealand, where both products have been used successfully for years. Goat’s milk-based baby formula is a safe and effective source of food for infants – having been tested and certified by the EFSA, the European Food Safety Authority. Bambinchen is distinguished by a very favourable fatty acid pattern, valuable amino acids, high-quality, easily digestible proteins, and a much lower allergy potential overall. This may be of particular interest to families susceptible to eczema, soy intolerances or cow’s milk protein intolerances. Children suffering initial symptoms of gastrointestinal problems or eczema will very likely be able to tolerate goat’s milk.